Check out Tobi's Harlow Off Shoulder Bodycon Dress Rock the smocked look with the Off White Harlow Off Shoulder Bodycon Dress. This strapless bandage dress fits like a glove, perfect for showing off those shoulders at outdoor concerts and long walks with your spring fling. Rock the smocked look with the Off White Harlow Off Shoulder Bodycon Dress. This strapless bandage dress fits like a glove, perfect for showing off those shoulders at outdoor concerts and long walks with your spring fling. 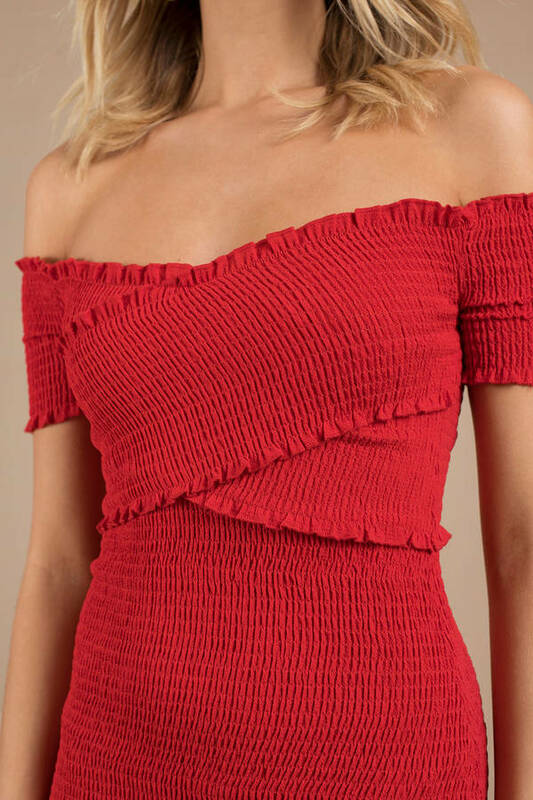 Rock the smocked look with the Red Harlow Off Shoulder Bodycon Dress. This strapless bandage dress fits like a glove, perfect for showing off those shoulders at outdoor concerts and long walks with your spring fling. Off White modeled on a size Small.